We are from the National Committee Against the Wall in the Beit Omar area of Hebron, Palestine. 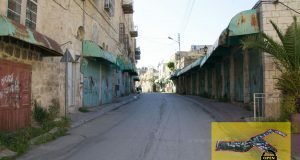 We work against the racial discrimination wall, Palestinians and Israelis together with the common aim of stopping the wall in the Hebron area, in villages and towns such as Beit Omar, Jabaa, Yatta and Twani. We have been working together for the past five years, and all this time we have been using the car that belonged to Mr. Ezra Nawi, an Israeli. Even though it was his own private car, we Palestinians used it more than him – he even paid for all the fuel. He himself has been struggling literately day and night in an effort to strengthen the Palestinian villagers in the South Hebron area as the Israeli government and settlers try to expel them from their land. Rain and shine he was there, building water wells, planting olive trees, ploughing fields, organizing summer camps for the children, taking patients to the hospitals, and filing scores of complaints against settler violence. With his car, we managed to reach areas that the Israeli army prohibits Palestinians cars from entering. We used it to travel all around the different areas in the Hebron region, and we were very grateful to him. Unfortunately, the car was stolen during a protest against the wall on Monday April 17th. We searched everywhere but had no luck finding it. It was a 4X4 Mitsubishi Magnum pickup truck, which Ezra used regularly for his political activities. Unfortunately, Ezra did not have theft insurance. We’re sending this message to you, hoping to find some comfort. In this difficult situation, we can not afford to buy back Ezra’s car – and of course he did not ask us – as the amount is too much: nearly $23,000 (US). If you could contribute any amount of money to help us buy back the car for him, we would be very grateful. 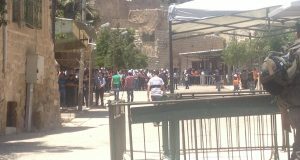 Israeli miltary forces violently prevented worshipers from Shufat refugee camp walking to Al-Aqsa Mosque to pray the Friday prayer. At the time of sending this message Kobi Snitz from Anarchists against the Wall is still being held in Israeli detention. In the last week we had two decisions by the supreme court of the Zionists state which remind us how racist this regime is. The first one is the citizenship law which will affect thousands of Palestinian families on both sides of the Green Line and the initial decision of the Bil’in court case. No one (including me) would have believed that Israel would take such a crazy step as this untill the last few months. There no country in the western world that has taken such a step, even the countries that had terror attacks on their civilians on their territories. This means terror attacks shouldn’t be used as an excuse for legislating an apartheid law There is no one in the world who can say that if there is someone from a racial or religious minority who took a violent action against the country’s citizens that that community should be collectively punished. However, this was the reason that secret services in Israel brought to the judges to convince them but it was just a game that they used to play it (security). It’s known, though, that the real issue they are concerned with is the demographic issue, even though the president of supreme court said that since 1993 there was just 16000 applications submitted from Palestinians to unite families which means that there is no real danger but no one mention the reality behind this law which is Israel state is Jewish state. Which means there is no place for anyone who is not Jewish! However it wasn’t going to approve a law such as this, despite the disgraceful silence and the support from the international mainstream community which made Israel feel supported even in such a racist step as this. The silence that the international community continues in especially after 58 years of occupation to the historical Palestine, Israel is still refusing to take responsibility for the refugees and the massacres that happened at that time and still doesn’t recognize the UN security council resolutions such as 194, 242 and 338. Later Israel declaraed the “unification” of Jerusalem as a capital for Israel, formally annexing it. East Jerusalm is an occupied territory according to international law. To consolidate their occupation, Israel continues building settlements in the West Bank with full Western support and finally, the Wall or what is so called the “security fence”. All of these facts on the ground makes me not really surprised to see the supreme court in Israel approving one more racist law which is just one piece in a series of acts that aims to “evacuate” or “transfer” the local and the legal owners of the land from their lands by making their life and existence impossible. “We are living in the 21st century and we can’t do the same things that we did in the past to continue the transfer. There are more inelegant ways for that by making life impossible for people so they leave without terrifying them in the way the Hagana and other Jewish millita groups did during the so called ‘war of independence’ ” – an Israeli Friend. Last Sunday May 14th , the supreme court in Jerusalem was discussing one more important issue – the wall case in Bil’in, a small village west of Ramallah in the West Bank. Fortunately there is no final decision yet, even after a discussion which continued untill 9:00 pm local time. From the discussion there was an important thing that was mentioned . This again amounted to more racism and discrimination under the name of security. The thing the judge said was that the reason for building the wall was to protect the Jewish citizen from terrorist attacks with no regards if the wall on the green line or not and with no regard to the legal rights of the owners of the land. However, the wall in Bil’in like in many places is built to protect settlers, who according to international law have no right to be there since they “settle” in a land that stolen by force from its legal owners. Building the wall to protect Jewish citizens conceals a dangerous fact: Israel has started with its own unilateral plan. Its an introduction to building the wall around the main settlement blocks such as Ma’ale Adumim, Gush Azion, Alfe Menashe and Ariel. The plan calls for the settlement blocks to be annexed to Israel under the name of “security” and “protection”, again with no regards to their legal status. This will set a precedent allowing for the building of the wall in any place in the west bank for the same reasons. It’ss obvious to all that this is one more way to force the people to leave their homes. I don’t know or how far they can go using these justifications, but I would like to point out that from the Palestinian side, I don’t think the Palestinians want any more hassles in their life. We know the meaning of being a refugee – living in another country as a foreigner. The people have decided that they aren’t going to leave Palestine again. On the other hand, the international community should wake up and take their responsibilities to guarantee human rights and the application of international law, and put pressure on Israel for making more racist laws to transfer the Palestinians from their homes. After prayers at Bilin’s mosque, male worshippers spill from the modest building and begin the short walk to the West Bank barrier running close to the village. Every Friday for the last 15 months, members of the community have marched along the village’s winding tarmac road past the olive orchards and up a steep hill to where the barrier is protected by helmeted Israeli soldiers in full riot gear. For the 1,700 villagers, the protest has become an article of faith. According to Abdullah Abu Rahma, 35, the organiser of the weekly protest, the barrier annexes about 60% of the village’s land, cutting farmers off from their fields, making it almost impossible to make a living. Swelled by a number of Israeli and foreign peace activists, the weekly protest is the longest running demonstration against the barrier in the West Bank. Each week, the protesters are met by the Israeli troops and a face-off ensues. Chanting slogans, the protestors clank stones on a waist-high yellow metal gate a few feet away from soldiers protected by three armoured military jeeps. The demonstrators say they want to access the village’s land on the other side of the barrier. While billed as a peaceful demonstration, the protest normally ends in violence – with both sides accusing each other of provocation. On the Friday I attended the march, it was not clear which side started the violence. But within minutes, the protestors were running for cover from the rubber bullets and stinging tear gas. 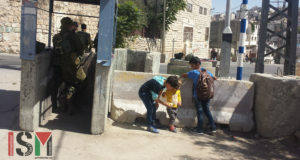 Some teenagers, with slings, crouched behind rocks, before briefly standing up and hurling stones at the Israeli soldiers on the other side of the barrier. The Israeli army only responds to protect the barrier or when stones are thrown at soldiers, says army spokesman Captain Jacob Dallal. “The protestors are only interested in provoking the Israeli army,” he adds. Two settlers from a nearby settlement standing on the Israeli side of the barrier, provoked a furious response from some of the protestors. ‘’It’s our land, it’s our land,’’ one man cried, as he ran up the hill to get closer to the settlers. But for many Palestinians, the 685 km barrier, which annexes 8% of the West Bank and puts East Jerusalem on the Israeli side, amounts to a land grab of territory earmarked for a future Palestinian state. The International Court of Justice issued an advisory ruling in 2004 that the barrier breached international law where it is built on occupied territory and should be dismantled. In the last year, Bilin’s villagers have seen some successes. Represented by Tel Aviv lawyer, Michael Sfard, the residents have challenged the route of the barrier round their village. Their case will be heard by the Israeli High Court later in May. They have also secured a temporary ban on a nearby settlement continuing its construction work on 750 new housing units. The villagers say the construction is taking place on their land. By aligning the villagers with Israeli and foreign peace activists, many of the protestors believe that the success of the demonstration has been in its broad appeal. “People turning up from all walks of life is the heart of this demonstration,” says Israeli Yuval Halperin, 26, a book editor from Tel Aviv. For some of the protestors, the Bilin demonstration represents a new way of tackling the Israeli occupation of the West Bank. Mansour Mansour, 29, believes that the protests at Bilin can be repeated successfully across the West Bank. The Palestine crisis is now more dramatic even than apartheid, but it is the victims who are punished. Western leaders are frustrating democratic elections in Palestine by withholding aid, and using collective punishment, an economic siege and starvation as political weapons in their efforts to get the Hamas government to accept their terms of business with Israel. Never in the long struggle for freedom in apartheid South Africa was there a situation as dramatic as in Palestine today: even though children were killed for resisting a second-class education; the liberation movement’s leaders were locked up for decades on Robben Island; new leaders were assassinated; church leaders were poisoned; house demolitions and forced removals were frequent; and western governments told South Africans who their leaders should be, andwhat their policies should be. The African National Congress confronted the military, economic and social power of white rule with a small guerrilla army, the mass support of the people and a moral authority that won it a following among millions around the world. Many now forget that the abhorrent apartheid system was treated as normal in the powerhouses of the world: entrenched interests meant the western media produced a sanitised version of its suffering and injustice. Today western moral authority in the Middle East is gone, as much because of years of double standards in Palestine as because of the current disastrous war on Iraq. There is no excuse for not knowing the truth about what is now happening to the Palestinians. And the most recent diplomatic moves by the Quartet – the US, the EU, the UN and Russia – to alleviate suffering, while keeping up the ban on dealing with the Palestinians’ elected leaders, are totally inadequate. Some plain speaking on the current crisis, and on what will happen without serious political intervention, shows why. The root problem is the intensifying Israeli occupation of Palestinian land. Despite the international court of justice ruling it illegal, Israel’s 390-mile wall snakes on through the West Bank, taking another 10% of the land and providing for the expansion of illegal Jewish settlements. Nearly 50,000 Palestinians are to be left in limbo on the Israeli side of the wall; 65,000 will face a daily commute through 11 transit points. Towns such as Qalqilya and Jayyous, formerly prosperous, with fertile hinterlands and good water supplies, are virtually encircled, with their farms and greenhouses on the Israeli side. Meanwhile, Israel is withholding $50m a month in customs duties and tax owed to the Palestinians, and energy supplies have been cut off. Palestinian civil servants, teachers, doctors and security forces have not been paid for over two months. The potential for civil war between factions of armed, increasingly desperate men is so obvious that Palestinians are not alone in thinking that the US actually wants such self-destruction. The Palestinians are having sanctions imposed on them for their political choice. But it is Israel, creating new facts on the ground to prevent the emergence of a viable Palestinian state, that should be facing UN sanctions. The UN secretary general, Kofi Annan, should use his last months in office to call for sanctions to bring about the implementation of the ICJ ruling on the Israeli wall, the closure of West Bank settlements and the release of Palestinian political prisoners. And those who care for freedom, peace and justice must build a global Palestine solidarity movement to match the anti-apartheid movement of the 1980s. • Ronnie Kasrils was head of intelligence in the African National Congress’s armed wing and is now South Africa’s intelligence minister; he is writing in a personal capacity.